Falafelkid.com: Microsoft planning motion sensitivity for Xbox360? Microsoft planning motion sensitivity for Xbox360? Microsoft is planning to introduce motion sensitivity to the Xbox360 "by the end of next year", XboxFamily has learnt. The details are still sketchy, but it appears a first-party add-on to existing controllers may be the delivery method of the technology. (...) It appears Microsoft has contracted the Saratoga, California firm, Gyration to handle the peripheral. Gyration developed the first motion sensing Nintendo game controller prototype in 2001 and developed much of the interaction concepts between motion controllers and game play. Now, you may not have heard of the news site at the source of this rumour since they are fairly new. Registered to an address in Cincinnati, Ohio, they are "comprised of several original members of SEGAone.com which originally launched in the fall of 2000", according to their own history. The new site was founded this year and initially off to a shaky start. But they seemed to have turned a corner within the last few months. We’re positive the images going around the net are not of the new hardware. 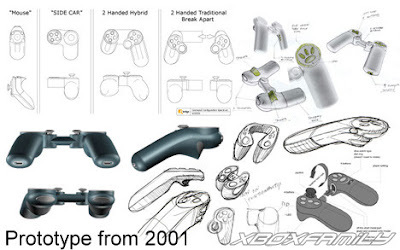 (...) [They] are images of the original motion-sensing prototypes that Gyration had designed for the Wii in 2001. I would not rule out that the people over at XboxFamily are trustworthy. If they have indeed worked as game editors for more than seven years, it is possible that they may have good enough sources to break a story like this one. But please bear in mind that motion sensitivity for the Xbox360 can only ever come in the form of an optional peripheral. And the rumour claims no more. So such a peripheral can achieve no more than the ´Eye Toy´ camera achieved for the PlayStation2. Sure, that peripheral was a small revolution in gaming. But since it was a peripheral, only a dozen games or so actually made use of it, although ´Eye Toy´ sold very well. Also, bear in mind that Microsoft, at least until recently, appeared highly sceptical of motion sensitivity. At the E3 2006, Robbie Bach snubbed at the idea of motion sensitive controls, in an interview with me. There are two things to know. One: we did gyroscopic controls in a controller six years ago. We know exactly how interesting it is. And it is useful for a very narrow segment of the games. So it is interesting as an add-on. It's not at all interesting as the main controller for your game console and we know that from experience. We also know that Sony took out of their controller the ability to get rumble feedback and tactile feedback. And that is the number one requested feature for people as an add-on to their controller. So we think their controller actually went down in capability, not up. EDIT Respected Xbox news site TeamXbox has thrown their weight behind this rumour. It appears that XboxFamily really were onto something. Nintendo really had the right idea on motion sensitivity, didn't they? dnt forget buttons. im pretty sure nintendo came up with buttons..
nintendo makes money. I think thats enough for people to start taking em seriously. sadly it seems to attract lame games that just wanna live off the wii brand. ok haha im sure everyone will LOL at my funny name calling like they do at yours ials. Warner Brothers goes Blu-Ray exclusive. nice plan from Microsoft.. its really cool.. thanks for the update.. keep blogging..
Gyration producedguild wars 2 key the first motion realizing Manufacturers sport game controller prototype with 2001 along with designed a lot of the actual relationship methods in between activity RS goldgame controllers and hands per hour.